An Amulet for your Money. A disk of two inches featuring a five point star framed with wood and vines. Each field colored with enamel and paint representing the elements: Red for Fire, Blue for Water, Yellow for Air, Black for Earth, White for Spirit. Enameled and painted. Using the classic solid spring clip for easy use. The Piece is solid and sturdy. Available in Sterling Silver, Nickle and Bronze. The Ace of the Tarot Card represent the “source” of a given element. In the case of the Ace of Pentacles: the material world. Pictured in the classic Tarot card as the point where all elements may be seeded; surrounded by a sacred space: a garden of possibilities. Like the Card, the clip also hold the potential of all good things: space, elements and star. The Ace of Pentacles reminds us: if we focus on the positive, we plant the seeds of good fortune. Grandpa used to say: “Son, if your want to double your money, just fold it in half and stick it in your pocket!” Here is your chance to do just that: next time you want to double your money, use this clip to secure it and keep those bills safely in your pocket or purse. 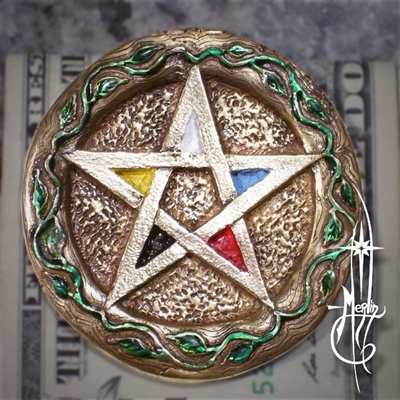 The Ace of Pentacles Money Clip is an Amulets by Merlin creation; designed, developed and crafted by Kirk McLaren of Amulets by Merlin. If you wish modifications, contact him and the piece may be made custom to fit your vision. To get yours: please visit my Ace of Pentacles Money Clip page To see my spring loaded, jaw action Skull and Dragon money clips, please visit my Money Clip Page.